Photo Writing - Exploring Photography. : Lens Diffraction - Should you care? Imagine a small hole in a sheet of black cardboard that we shine light through onto a wall. The light that hits the wall will have a bright central spot that will gradually fade to its outside circumference. if the cardboard with it’s hole is brought closer to the wall the spot will appear more solid, the further the hole gets from the wall, the smaller it is in relation to the circle of light on the wall and the less distinct the edge of light on the wall is (closer the hole, the more ‘focussed’ the light, further the hole, the less ‘focused’ the light). Now take this visual demonstration and apply it to the light travelling through a lens and past the aperture blades onto the sensor or film plane. If the aperture is closed down to a very small hole, there is effectively more interference at the edge of the aperture with the light in relation to how much light is passing through the aperture. Small apertures will consequently result in slightly softer images in comparison to larger apertures where there is less interference with the edge of the aperture blade in relation to the size of the aperture itself. Sadly this doesn’t mean that opening up the lens to wide open will result in tack-sharp details in the image capture. Diffraction in the glass is also apparent in the way that light spreads as it hits a transparent medium. Lenses are designed for particular purposes to be at their sharpest at a certain aperture. Long exotic telephotos are usually designed to be at their optical sharpest wide-open. Most other lenses tend to be at their sharpest and have the least amount of vignetting (another phenomenon in the way that light passes through the lens) 2 stops from wide open (so if you have a f5.6 lens then theoretically it will be at it’s sharpest at f11)for some more details on this you can also read my post on confusing circles and airy disks on this link. Photographers ultimately have to make compromises between depth of field and sharpness when they are creating images. 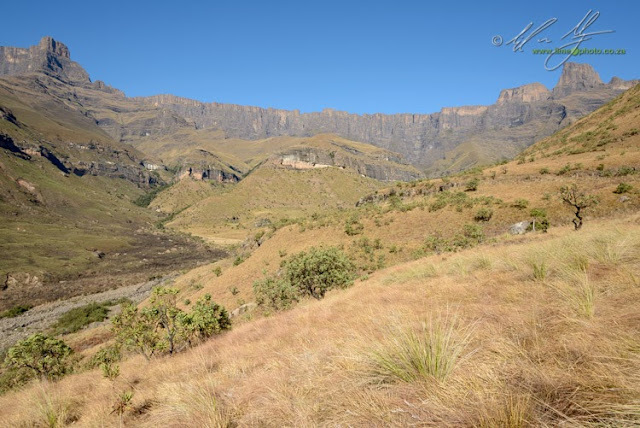 Some landscape photographers get around this by using tilt-shift lenses so that they can get increased depth of field via something called the Schiemflug effect. For most people though, we can try to use sharpening techniques in post-production to hide any loss of resolution as a result of the diffraction inherent in our lenses. Which finally brings me to my own test on my D800 camera. I initially tested the camera and a 24-120mm f4 lens (recommended by Nikon and DXOMark for use with the D800) on a bank note and test chart in studio. Then I realised that I don’t shoot bank notes and test-charts for a profession, so instead took a series of images while on my last workshop in the Drakensberg. I set the tripod up and released the images via a cable release on Mirror Lock-up after having focused and checked that focus in Live-View zoomed in. There wasn’t any wind, so the images should to all intents and purposes be shake free and in focus. The above image is the very bland shot that I chose to perform the test. Below are the results of a 100% crop from a section just to the right of centre. It became rapidly apparent that the sharpest aperture on this particular copy of the lens is F5.6. 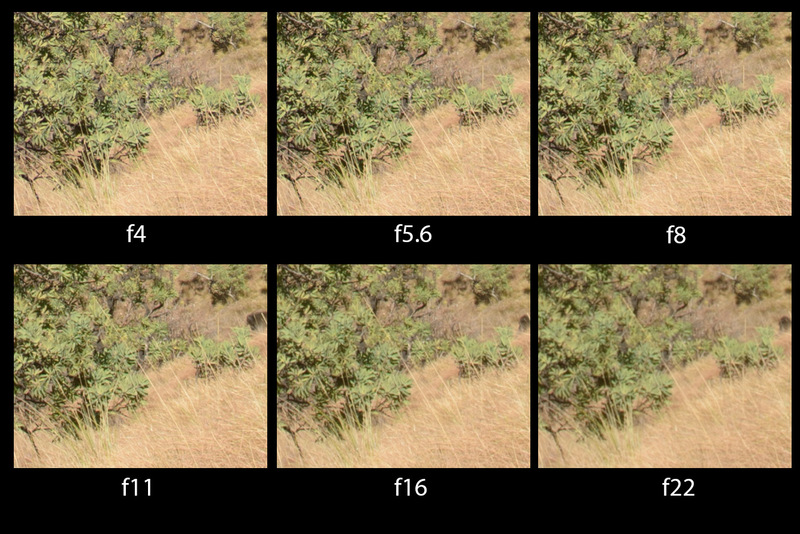 Detail drops away rapidly after f8 with f22 being the softest of all the apertures. My immediate impression was that f22 is essentially unusable for landscape work unless I have a pressing need to keep the aperture small. The problem of course is that as a landscape photographer I do need greater depth of field than is afforded by f5.6. With my D3x I'm usually around f11 which is the theoretical diffraction limitation of most lenses on a 24MP sensor. I currently don't own a tilt-shift lens, and also happen to enjoy the 20-22mm field of view on a Full Frame camera (where there are no Nikon TS lenses anyway). The next experiment was then to see what sharpening could bring back with the equipment that I do own. 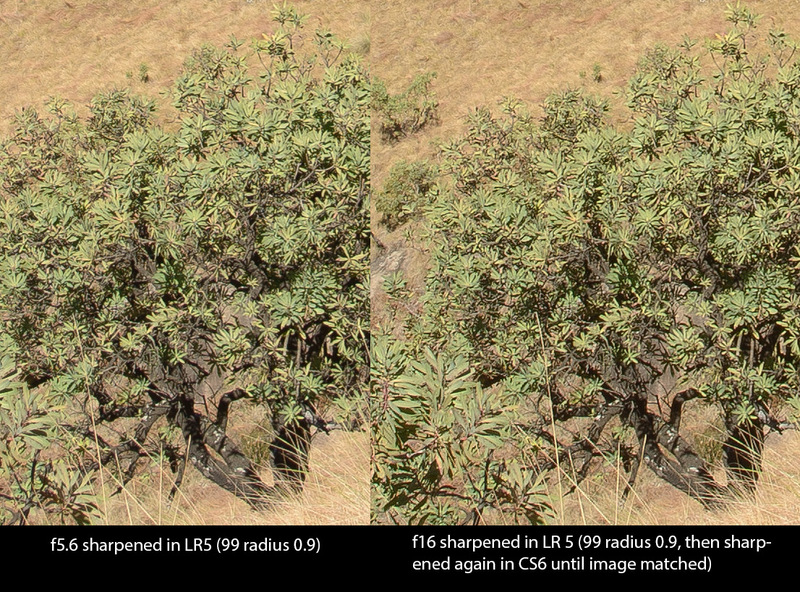 The image below shows f5.6 and f16 with different levels of sharpening. Both images went through Lightroom 5, which incidentally is not my preferred tool for landscape images, with a standard sharpening of amount 99, radius 0.9. Yes, I could have been a little more subtle but I waned to see what an average amount of sharpening would do to the images. Immediately the detail came back in the f16 shot, but the f5.6 still held it's lead in terms of sharpness. Then, with the sharpened images now in Photoshop, I played with the unsharp mask. The f5.6 file couldn't take much more sharpening before details started to grow halos. The f16 image on the other hand could still handle quite aggressive sharpening until the two began to look very similar indeed (at first glance the f16 image even looks sharper than the f5.6 version, but note the loss of clarity in the grass in the background). My admittedly unscientific conclusion is that with careful sharpening (which this was not) you can indeed shoot at lower apertures on a high resolution camera like the D800 or the Canon 5Dmkiii. There probably is some loss of resolution, but quite frankly it's difficult if not impossible to notice this with the naked eye. My preferred tool for landscape processing is actually Nikon Capture NX2 which I find has a far better sharpening tool than Adobe's (I speak obviously as a Nikon shooter here, and this probably wouldn't be the same for a Canon user). Having said this I would be reluctant to stray below f11 on the D800 (I can get away with f14 on the D3x) for maximum sharpness and a decent DoF. An alternative is to shoot multiple frames at different focus settings to stack together. It is however a tedious option and a one frame shot tends to be my goal when shooting. The best advice that could come out of this is to test your gear to learn exactly what it does. Some lenses perform better at lower apertures than others. It's worth knowing which ones.